MillerCoors’ Coors Light brand had a solid following among Puerto Ricans, but didn’t have significant favorability with Dominicans or Mexicans, groups that are both growing at a faster rate as part of the U.S. market. 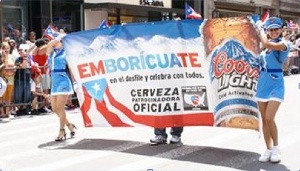 To increase sales of Coors Light among Puerto Ricans while also initiating trial, adoption and frequent usage with the other groups, MillerCoors and The Integer Group opted to capitalize on the brand’s sponsorship of the National Puerto Rican Day Parade on June 12, 2011 by encouraging Latinos to celebrate it as a day for all. “Emboricuate” means to become Puerto Rican, or to Puerto Ricanize yourself. 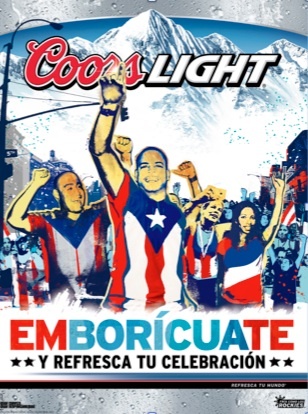 The call to action of “Emborícuate y Resfesca tu Celebración” – “Be Puerto Rican for the day and refresh your celebration”– played off the Coors equity of Rocky Mountain cold refreshment. 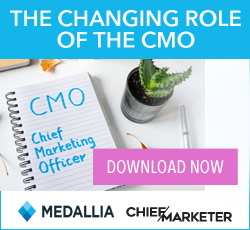 Prior to the parade, MillerCoors partnered with Dominican promotional agency BoncheUrbano, which sent email invitations and announced Coors Light bar promotions on its site. Spokesmodels engaged bar patrons in domino tournaments (a national pastime throughout the Caribbean). Radio spots were dedicated to memorable moments and great achievements in Boricua (i.e., Puerto Rican) history. The top bodegas and supermarkets, representing 30% of the Hispanic market in the Bronx, Queens and upper Manhattan, were merchandised with colorful “Emborícuate” materials in four locations along the path to purchase, including exterior window banners, interior ceiling pennants, floor decals and beer cooler static clings. Coors Light beer displays were merchandised with “Emborícuate” display cards, pricing cards and (while supplies lasted) take-one commemorative posters. The parade featured a Silver Bullet train float staffed by six conductoras (conductors) and 12 agency staffers handing out bandannas, headbands and t-shirts to spectators along the parade route. Faux snow machines blasted Rocky Mountain Cold Refreshment “snow” from the train, while Puerto Rican reggaetón artist Tito “EL Bambino” sang his hits. For the balance of the month, the promotion continued in bars and restaurants with dance competitions utilizing the agency’s tie-in with the Sony Singstar® gaming platform. The most talented were rewarded with Boricua merchandise, while their performance was replayed on a projection screen. With the state of New York ranking 4th overall in U.S. beer consumption, shifts in consumption of the 2.4 million Latino inhabitants of New York City have to be momentous to move the needle one direction or the other. Squeezing out an increase in an environment where industry volumes have declined 2% makes this task even more difficult. At July’s end, case equivalents in Manhattan accounts were up 15.5% year to date; in Queens 7.7%; and in Brooklyn 5.5%, averaging out to a 10.9% year to date increase across all three boroughs.